does anyone noticed this Modem/router based on Broadcom BCM63138 ? This modem/router comes from the italian ISP TIM, but can be unlocked to the original Technicolor Firmware. This will enable FULL ROOT access to the device, SSH + Telnet ! Not had a chance to look over this in detail and wont till much later tonight but any mention/chance of VPN tunnel capability? Allora, perfetto per praticare il mio italiano! "So, perfect for practicing my Italian!" This is the cheapest modem/router with a BCM63138, other brands like Asus/Netgear are way more expensive, around 200€. When it's unlocked, do you get access to the Busybox shell, or is it just the normal Technicolor CLI? From what i read you have root access from SSH, so you have full control. I oredered one yesterday, i should receive it next week, i will be able to answer to all questions. This tool allows root access to the modem. After logging in, you can install the original Technicolor interface, enable many options in the web interface and more. Once the automatic procedure is completed, the modem will be accessible with SSH protocol and username / password: root / root. The root is resistant to a reset or a firmware upgrade. If the reset button is pressed, only the original interface and configuration will be restored. 2) Disattiva cwmp = Disable cwmp = Disable TIM from accessing the router and upgrade to a new firmware. 3) importa e esporta conf in chiaro = Import/export configuration files unencrypted. So you will be able to edit the conf file. After checking everything you just have to click the "Sblocca Ora!" button to unlock the firmware. And now you can connect to the web interface and see the new technicolor Webui, and you can notice it supports other languages than italian. The new Technicolor versions are based on Openwrt (ChaosCalmer for precision). It follows that theoretically by forcing and fixing some configuration files it is possible, theoretically, to install additional packages on the modem. No studies have been done on this. Anyone making progress in this regard would be keen to share their experiences on the forum. What allows me to do this process? Virtually everything. This type of unlock is even more powerful than AGTOT. In that case, you enabled the root user but it was in a small shell. In this case you are 100% root. The router files, being all based on OpenWRT Chaos Chalmer, are r / w and accessible with SCP protocol. 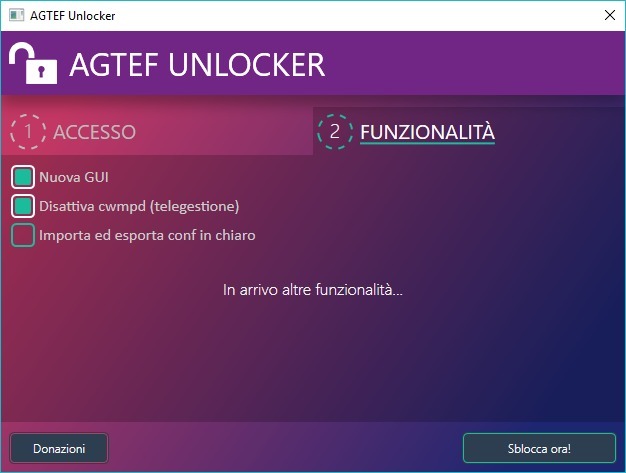 By unlocking it you will be able to enable the telnet protocol from gui. To access it, you can use any SSH client such as Putty. An autoupgrade system has been inserted. Every day, the modem will check with the repository and report updates on the gui. So it appears that enabling telnet should be straightforward. [Later] I started to order one from the link given, but it wanted to charge me EUR 100 for delivery. Simple man question: why no UK version? Technicolor sell mainly (or even exclusively now) through ISPs, so their availability in any country depends on the ISPs in that country. WTF, i'm in France and i was charged 8€ only Contact the seller there should be something misconfigured about shipping costs. It looks as though Technicolor have put a stop to international sales. It's a shame, because it looks like an interesting product. i contacted the Ebay seller and explained the problem he told me a few minutes ago that he will check this tomorow. So keep an eye on it. The counties listed by Callflow impress, but checking a number of large town centre postcodes seems to tell not the same story.